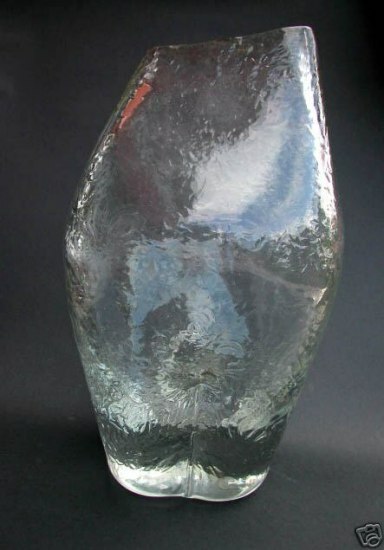 The origin of the great Italian centre of glass-making at Venice cannot be traced with centainty much farther back than the tenth century. 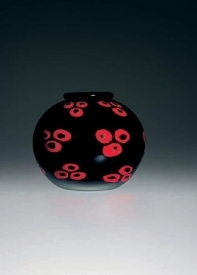 There remains, hawever, the possibility that the industry was carried on before this date on a small scale, especially for the nanufacture of tesserae for glass mosaics inspired by those of Byzantine Ravenna. In 1291 the Venetian Senate decreed that, because of the increasing risk of fire from the number of furnaces operating, the industry be removed from the Rialto to the Island of Murano. 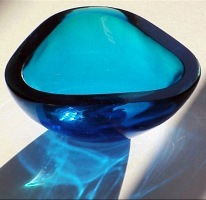 The concentration of the industry on the Island of Murano ledto monopoly under the aegis of the Republic of Venice. To maintain the monopoly and the manufacturing secrets severe penalties were enjoined for absconding workmen. 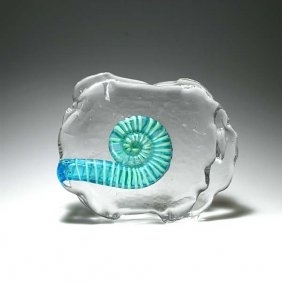 Despite this, some glass-makers went to France, England, Spain, Germany and the Netherlands, and it is often difficult to decide where a particular specimen was made, so clesely do they resemble each other in style. 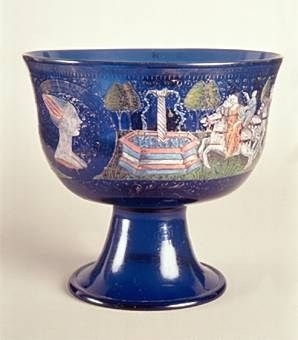 Enamelled goblets remained fashionable until the end of the first quarter of the 16th century. 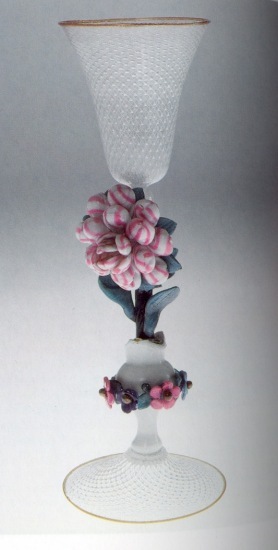 After 1500 enamelled glass tend to be more simply decorated, principally with shields of arms and motifs of the period. Enamelling was abandoned and decorating glass by engraving with a diamond began about 1560. There was also a marked tendency toward discolouration obtaining the glass called 'cristallo' for its resemblance to the much-valued hardstone rock-crystal. 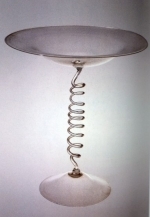 The development of an opaque but translucent white glass was inevitable obtaining a glass resembling to Chinese porcelain. 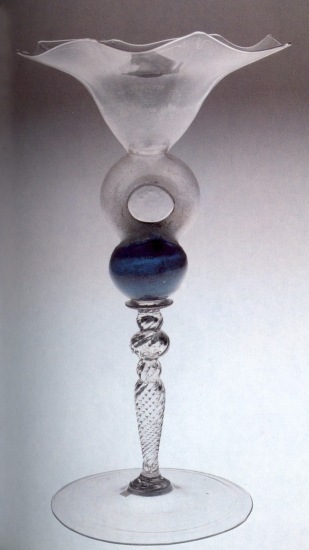 The use of trailed threads of glass developed into a mode of decoration in which canes were used to form complex interlacing patterns, the finer of which were called 'vitro di trina' (for there resemblance to lacework) but 'latticino' being the more general term. 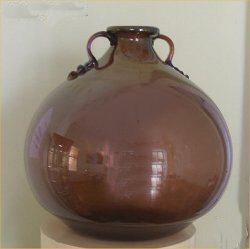 Especially during the 17th century mirros formed a large part of Venetian Murano production (they had been made since the early years of the 16th century). But the opening of the sea-routes to the Far East by way of the Cape greatly reduced the importance of Venice as a centre of Oriental trade on which its prosperity had been largely based and the glass-making declined as most other Venetian industries. 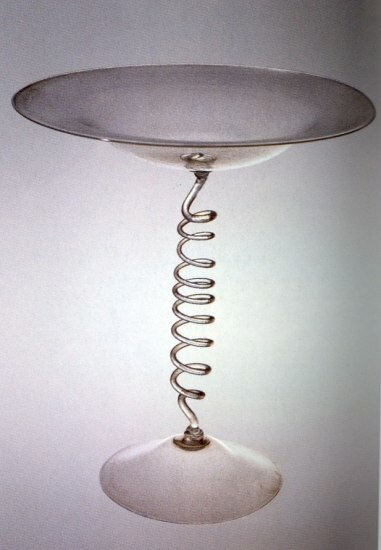 The 18th century saw the adoption of novelty for its own sake, and of attempts to follow fashion instead of to lead it. 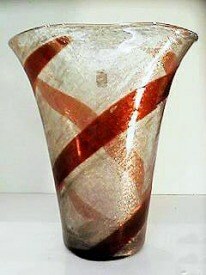 But the decline was inevitable and Murano glass production at the beginning of 19th century was higly compromised. 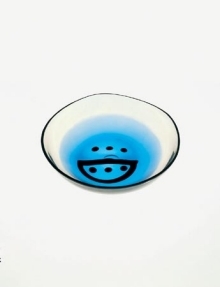 A sector of Murano glass not suffering the 19th century crisis was beadmaking that, with the name of 'conterie' covers all the enamel cakes and varietis of beads widely known as 'Venice beads'. 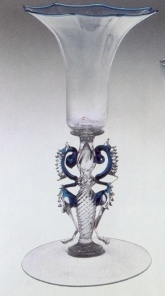 Around 1860 only furnaces of bead were funcioning on Murano, while the mosaic industry was developing and blown-glass work was fully abandone. 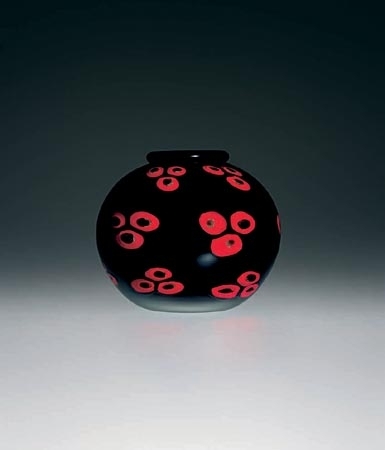 Only in 1861 the master glassmakers Toso, Fuga and Baroveier from the F.lli Toso glasswork succeeded in reproducing ancient ornamental blown glass rediscovering the attributes by which their ancestors had created magnificent objects over the centuries. 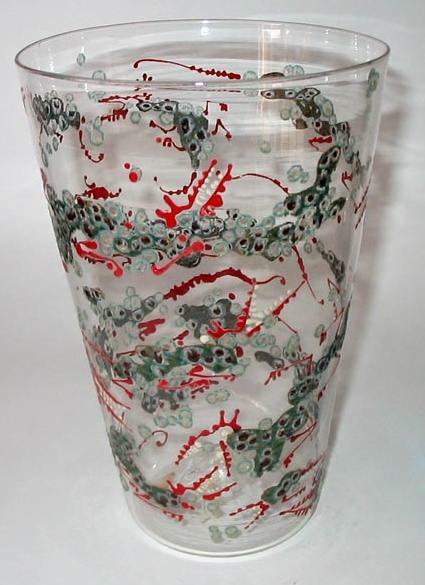 With the rebirth of the art of glassmaking on Murano, in 1866 Antonio Salviati founded Salviati e Co., the first glasswork in centuries to be devoted exclusively to artistic glass. 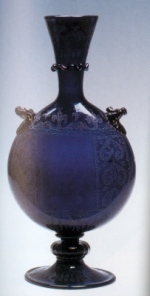 In the 1870s Vincenzo Moretti, the technical expert of the Compagnia di Venezia e di Murano solved the problem of reproducing the ancient Roman glass murrhines preparing glass for murrhines and cameo receptacles and working on rare glass as chalcedony, aventurine, ruby glass and enamels for mosaics. 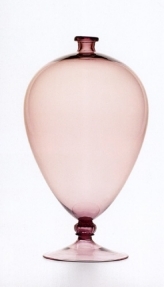 But the end of the 19th century saw many other leading master glassmakers as Giuseppe Barovier, Isidoro Seguso, Angelo Seguso, Giovanni and Giuseppe Barovier, Angelo Fuga. In the 20th century the galss art flourished in Murano and many important firms firms, master glassmakers and designers offered their contribute to the diffusion of Murano glass throughout the world. Bianconi e Venini, Giuseppe Santomaso, Riccardo Licata, Ferro Lazzarini, Paolo Venini, Nason e Moretti, Livio Seguso, Pino Signoretto, Ermanno Nason, Luciano Vistosi. 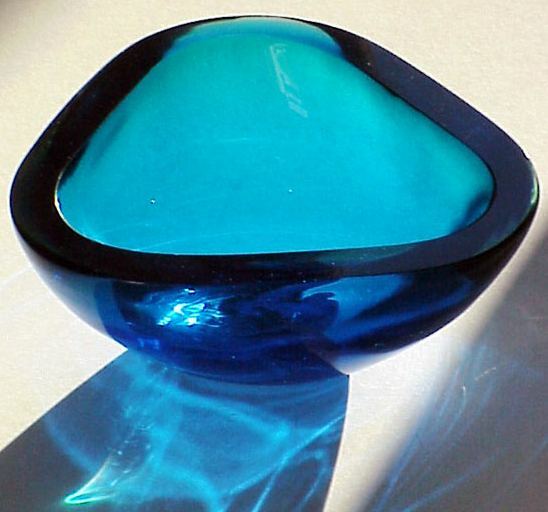 They produced outstanding pieces of 'pulegoso' glass, 'stained' glass, 'lattimo' glass, 'sommerso' glass (submerged glass),'murrina' glass, 'zanfirico' glass, 'graffito' glass, and much other more.